Amy Defayette is product manager, VarioFlow conveyor systems, Bosch Rexroth Corp., Hoffman Estates, IL: 847/645-3600, www.boschrexroth-us.com. Amy is located in Buchanan, MI; 269/697-5304. result, new requirements for speed and flexibility are being placed on the conveying systems used to support secondary operations and packaging systems. How can packaging operations keep up with constant change without increasing costs? Surprisingly, new choices in modular plastic-chain conveyors can help small to midsized suppliers of metal parts and assemblies create sustainable packaging systems, with lower costs over the long term, the critical flexibility needed, and a healthy reduction in their overall energy footprint. Most packaging conveyors are modular by design, available in preconfigured straight or curved sections that bolt together on the shop floor. They prove ideal for complex routing where assemblies and packages of small stamped parts must move up, down and around equipment and other obstructions in the plant, as compared to setting up a complex series of belt conveyors. Need to reconfigure your process flow, move equipment into a cellular setup, or add a conveyor loop off the side of a press line to accommodate a secondary operation? 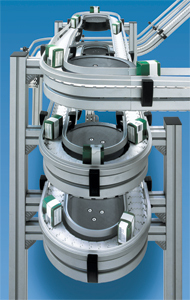 Modular plastic-chain conveyors might just fit the bill. Structural conveyor frames typically comprise extruded T-slotted aluminum rails, welded steel components or, if the manufacturing environment requires it, stainless steel rails. A welded steel frame is typically much more difficult to reconfigure should major upgrades or changes to the process be required. While many conveyors of this type may seem less expensive at the outset, the additional costs of frequent changeovers can lead to unexpected, unpleasant surprises. 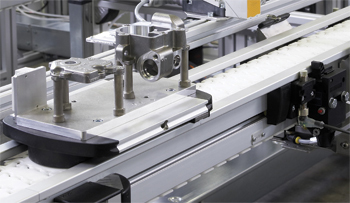 To build as much flexibility into a packaging or other manufacturing operation as possible, many companies turn to conveyors with an extruded aluminum frame, whose T-slotted design lets them reconfigure the system virtually at will, adding to or repositioning the originally purchased equipment. These anodized aluminum frames don’t need welding or painting, so they install quickly. The available T-slots in the extruded aluminum frame also provide a convenient attachment point for other accessory equipment such as lights, vision systems and labeling devices. If for hygienic reasons stainless steel is required, the better systems are designed to provide flexibility similar to that of aluminum systems, with slot-type openings along the conveyor rails, and similar bolt-together conveyor modules. By investing in conveyors that can adapt to constantly changing requirements, manufacturers can significantly reduce the total cost of ownership in their material-handling conveyors. Most packaging conveyors are modular by design, available in preconfigured straight or curved sections that bolt together on the shop floor. They prove ideal for complex routing where assemblies and packages of small stamped parts must move up, down, and around equipment and other obstructions in the plant. sophisticated product routing. Welded assemblies of stamped parts, for example, or boxes and cartons of smaller stampings being transferred by a conveyor may need to be elevated or lowered, accumulated or repositioned, and transferred around tight or long, sweeping curves. Most conveyors transfer packages or parts on a transport chain that slides along the conveyor frame on a slide rail of some type. 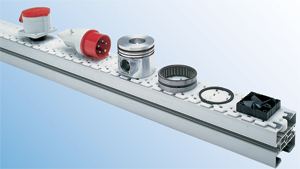 For straight conveyor sections, the friction inherent to any given system will be a function of material choices and the use of the appropriate chain types. Putting curves in the system significantly increases friction; for example, a typical 90-deg. horizontal curve can cause a 60 percent increase in friction. This in turn causes the drive motor and gearbox combination to work harder to pull the chain through the system. Adding the multiple horizontal and vertical curves common in many layouts increases friction, of course, and may require the use of additional drive motors—typically the most costly component in any conveyor system. So, the trick is to find a system design that will achieve the transport objectives while using the smallest reliable number of drives. Choosing a conveyor whose chain features a high tensile strength can help, since it allows handling longer stretches of chain with fewer drives. But for the lowest total cost of ownership and maintenance—and if there’s a need to accumulate product over a good portion of the conveyor—manufacturers may need to look for s to reduce friction in the conveyor’s curves. Many suppliers of flexible chain conveyors supply curve wheels, which essentially comprise a rotating disc that replaces the slide rail on the inside part of the curve where friction is greatest. This wheel allows the chain to move smoothly around the curve via the turning disc, rather than sliding around a stationary rail. Using a curve wheel in a 90-deg. curve can reduce friction to virtually that of a straight conveyor section, significantly improving the safety factors of the drive and the chain. In other words, curve wheels allow a manufacturer to reduce the number of drives in an overall system and have substantially greater confidence in the integrity of the chain during long-term operation. manufacturers offer calculation tools to help identify weaknesses in system design—overloaded drives or chain, for example—based on a given set of parameters. It’s important to perform these calculations, or to ask your conveyor supplier to do them for you, to develop the most cost-effective system over the long term that avoids downtime during critical production cycles. Large conveying systems often use long-sweep curves to transport fragile packaged goods through various processes on their to the shipping dock—these might be light-gauge metal parts whose surface finish must be protected, or where dents can occur from excessive jostling. These types of systems typically include long sections of accumulated product, which can cause a surging and jerking in the conveyor chain, especially around curves. To reduce friction and protect the product in long-sweep curves, and to maintain high overall system efficiency, look for curves equipped with ball bearings. This curve technology (patented by Rexroth) ensures smooth, trouble-free transport, and can mean the difference between virtually zero chain or gear-motor safety factor and a safety factor of 2.6 or more. Again, the increased safety factors resulting from lower-friction design means fewer costly, powered drive units and longer chain and system life. While leveraging conveyor-module enhancements to reduce friction will conserve energy during operation, to truly optimize energy savings it’s important to consider the efficiency of the powered drive itself, including the efficiency of the gearbox and motor. For large conveying systems, seemingly small differences can add up to surprising additional cost. For example, many custom-built and commercially available conveyors employ a worm gear that translates power at 60 percent efficiency and a motor operating at 78 percent efficiency, for an overall system efficiency of approximately 46 percent. But manufacturers that invest a little more upfront for a bevel-gear system that translates power at 95 percent efficiency and a motor that operates at 81 percent efficiency will boost total system operating efficiency to 76 percent. With increased pressure to minimize environmental and energy footprint, and the cost savings that can result from making a few smart choices, it makes sense to take a closer look at how you conveyor selection, to optimize parts handling, packaging and other operations required to move your stamped parts and assemblies. The need to stay flexible and keep pace with rapid change will only grow, as will the need to squeeze as much cost as possible out of every factory process.